The team behind the popular Costa Mesa restaurant ARC Food & Libations will be opening ARC Butcher & Baker, a new culinary concept in Newport Beach’s Cannery Village. The venue, which is slated to debut in the fall, will feature salads, sandwiches, toasts, and classic American fare like steak and potatoes. It will also offer a wide array of ready-to-serve family-style dinners for guests to take home. A full-service bakery will be on the premises. ARC Butcher & Baker, 417 30th St., Newport Beach, CA 92663, no phone. 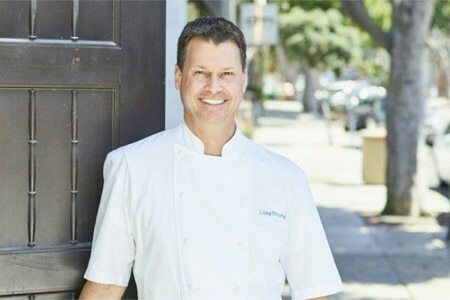 Craig Strong, the former executive chef at Montage Laguna Beach’s Studio, has revealed the name and concept of his new restaurant. Ocean at Main, which will be located in downtown Laguna Beach, will feature seasonal dishes driven by pristine ingredients, a culinary style designed to pay homage to his French mentors like the late Paul Bocuse. The menu will also emphasize California products and will honor the state’s reputation for healthy lifestyle choices. The restaurant is slated to open in October. Ocean at Main, 222 Ocean Ave., Laguna Beach, CA 92651, no phone. Left Coast Brewing Company has opened up a tap and tasting room in Irvine. The venue, which is located a few blocks south of the city’s Great Park, serves up a rotation of its award-winning craft beers in an industrial-themed space. Its brews are paired with a compact menu of Kansas City-style barbecue. Lunch & Dinner daily. Left Coast Brewing Company, 6652 Irvine Center Dr., Irvine, CA 92618, 949-387-5170. The restaurant group behind Costa Mesa’s The Country Club and Wild Goose Tavern has opened Playa Mesa, the collective’s third culinary foray onto the city’s bustling 17th Street. The venue serves up Mexican cuisine inspired by several of the country’s key culinary regions, including Baja, Oaxaca, Michoacán and Jalisco, as interpreted by executive chef Rolando Rubalcava. Also featured are a list of Mexican beers, Spanish and Latin American wines, craft cocktails, and a deep roster of tequila and mezcal selections. Playa Mesa, 428 E. 17th St., Costa Mesa, CA 92627, 949-287-5292. Brittany Valles has been named executive chef at Oak Grill, the flagship restaurant at Newport Beach’s Fashion Island Hotel. An Orange County native, Valles previously worked in Los Angeles under Michael Voltaggio, serving as chef de cuisine at the former Top Chef winner’s restaurant ink.well for seven years. Valles will also be in charge of the menu at Fashion Island Hotel’s popular cocktail bar, Aqua Lounge. Oak Grill, Fashion Island Hotel, 690 Newport Center Dr., Newport Beach, CA 92660, 949-760-4920.